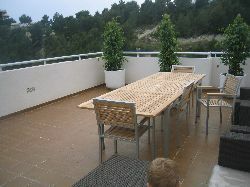 This brand new luxury apartment is situated in the Jardines de Altea Hills complex. The complex itself is part of the stunning five star resort of Altea Hills which boasts the 5* Altea Melia Hotel whose facilities are available for use by apartment residents. 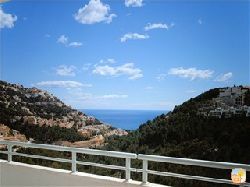 The apartment has spectacular views and overlooks the private complex swimming pool. A spacious lounge and dining area leads directly onto the large balcony and a spiral staircase leads to the beautiful roof terrace which has both comfortable seating and a further dining table. There is a table football game in the adjoining games room. 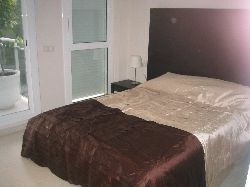 The master bedroom also leads onto the balcony and has an en-suite bathroom. There are a further two double bedrooms, a family bathroom and a fully equipped kitchen and utility room. The interior has been furnished and decorated to a luxurious standard by a local interior designer. Discounts available for long stays. 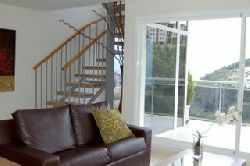 We also have a 2 bedroom apartment in the same block.